Now it's time for the real fun to begin! It's time to be creative and choose your blog name and its look and feel. Defining the focus for your blog, figuring out your audience and blog topics are important prerequisites for this step. If you haven't done that yet, you can check out my post Starting A Blog Part 1: Choosing Your Blog Focus. I'm not a blog expert. Nor am I am a design expert, but I'd like to share what I've learned during my time as a blogger and also from the research I've done for my blog. 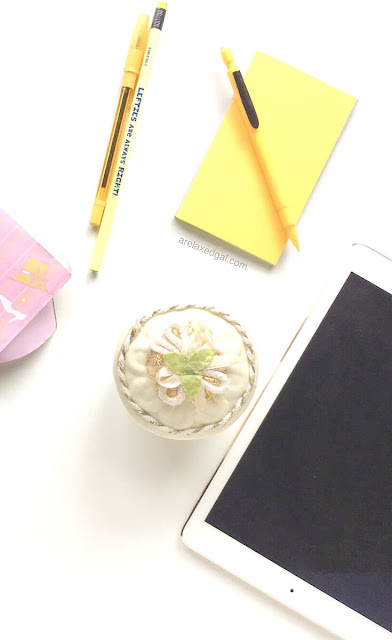 In fact, in this post, I'm sharing some of my favorite posts from other bloggers on creating a blog name and its look and feel. The name of your blog is important. It draws people in. It gives readers a sense of what your blog is about. Choosing a blog name can be a lengthy process or it can be an easy one. It will vary from person to person and blog to blog. After figuring out what you want your blog to be about, who your audience is and what value you want to bring them, a great place to start when choosing a name is to brainstorming. 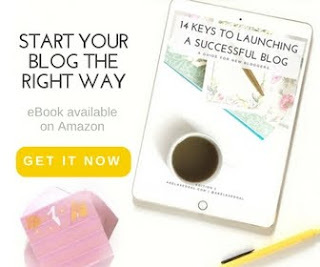 To do this start jotting down a list of words, names, and phrases that relate to your blog focus. Yes, whatever comes to mind. In brainstorming, there's no wrong idea. Does this name represent me? 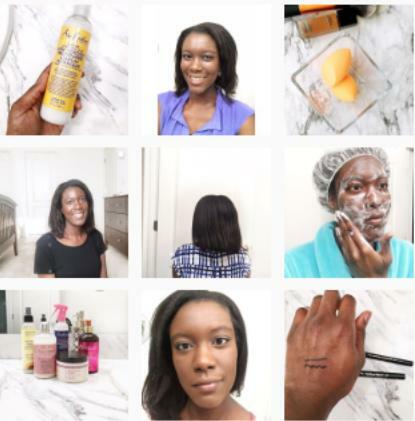 Does it convey what I want my blog to achieve? Is the name already trademarked? Are other sites or blogs using the name? Are the social media accounts available? Is it a name that can grow with me? If you aren't sure of the name you selected or still have several to choose from you can get input from others. 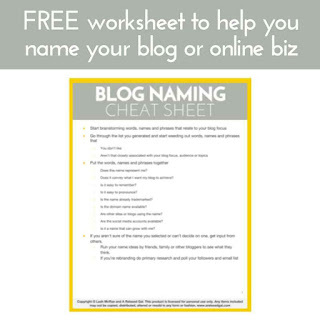 You can run your name ideas by friends, family or other bloggers to see what they think. If you're going through a rebrand you could do some primary research and poll your followers. The key visual components to creating a brand for any site or blog are colors, fonts, a logo, images, and graphics. Individually and together they set the mood for your blog and play a very important role in attracting followers. When I rebranded I wanted a look and feel that was bright, memorable, fun, and authentic. To help put my look and feel together I created a brand board. This helped me play around with colors and see how they looked and worked with each other. It also helped me play around with fonts and see how they looked alongside my colors. In addition to helping create my blog's visual brand, the brand board helps me stay consistent. Now, whenever I'm creating blog graphics I refer back to my brand board. It's been a lifesaver and I recommend creating one if you're serious about creating consistency with your blog's branding. A great way to set the mood for your blog, speak to your targeted readers and convey your blog focus is through color. Colors can say a lot - both negatively and positively. In fact, each color has emotional and psychological meanings attached to it. As you can see yellow is the main color used for A Relaxed Gal. I selected yellow as the main color mostly because I like it, it's bright, fun and cheerful. Fast Company's "What Your Logo's Color Says About Your Company"
Spruce Rd's "Psychology of Color for Your Brand"
CoSchedule's "Color Psychology in Marketing"
How do I want people to feel when they visit my blog? What are the color palettes of my favorite blogs and brands? Do these colors complement each other? Just like your color palette, fonts should help set the mood for your blog. They can make your blog attractive or unattractive to visitors. Design Your Own Blog does a great job of breaking down the different types of fonts and how they can be paired together in the post Beginners Guide to Fonts For Your Blog: How to Choose Font Combinations. I opted to keep my logo simple and to the point using my blog name, key brand color, and a handwritten font. Another great way to convey the feeling of your blog is through your imagery and graphics. They should consistently convey the tone and feeling of your blog. I admit that having consistency in my imagery isn't something I feel I'm doing a good job of. Jess Creatives "How to take Better Pictures for Your Website with Your iPhone"
Rebecca Jacobs "The Only Two Photography Tips You Need"
PinkPot "5 Time-Saving Tips for Blog Photography"
When it comes to my blog graphics though I feel the consistency has gotten better. This is largely in part from the templates I created in Canva. This is a free site that allows you to create professional looking graphics through easy drag and drop features. One final tip I have for choosing your blogs name and look and feel is to not rush it. Spend some time thinking through both and come up with multiple options. 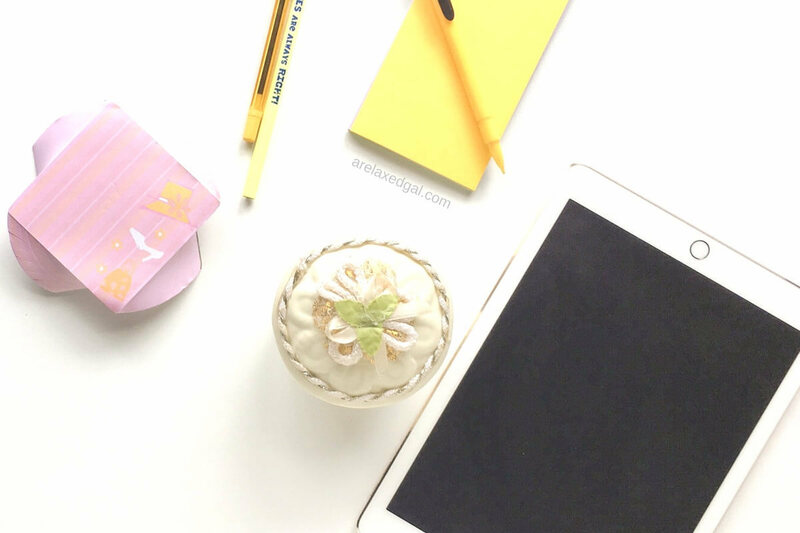 While you can change your blog name and look and feel, it can be hard and time-consuming. Especially if you've been blogging for a while or invested time and even money into the originals. How did you create your blog name and brand?